The director of “The Journey Home,” Roger Spottiswoode, made Pierce Brosnan’s second James Bond outing, “Tomorrow Never Dies.” While that movie didn’t live up to the far-superior “Goldeneye,” it did have its fair share of fantastic action scenes and car chases and ranks as Brosnan’s second-best Bond movie. I only mention this because Mr. Spottiswoode, a director known primarily for making action-oriented movies like the aforementioned “Tomorrow Never Dies” as well as “The 6th Day” with Arnold Schwarzenegger and “Turner & Hooch” with Tom Hanks, directed “The Journey Home,” a children’s movie about a young polar bear cub who gets separated from its mother. Mr. Spottiswoode handles the drama with deft direction and never panders to its intended young audience, making “The Journey Home” a genuinely, heartfelt movie. 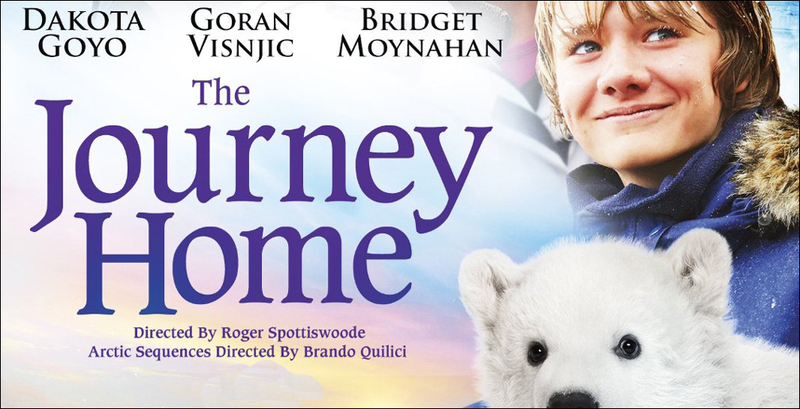 When Luke (Dakota Goyo), a young boy who lives on the ice fields of Northern Canada, hears a noise coming from outside his house one evening, he is surprised to find a polar bear standing in front of his garage. The local police quickly arrive and shoot the bear with a tranquilizer and take it away. After the commotion dies down, Luke hears some rumblings coming from inside the garage and upon further inspection, he discovers a polar bear cub that the mother bear was obviously trying to protect. Luke sneaks the bear into his bedroom for the night and the next day, when he finds out that the mother bear has already been transported back to the wilderness by helicopter, he packs up his snowmobile, towing the bear cub behind him with the intention of reuniting the two. Naturally, he doesn’t think beyond the clothes on his back, too enthusiastic and determined to get the bear cub back to its home and it quickly becomes apparent, as a storm moves in, that he must figure out how to survive. When Muktuk (Goran Visnjic), a friend of Luke’s family and the best tracker in the area hears about what happened, he packs up his stuff and heads out into the icy wilderness to rescue Luke. With the storm fast approaching, Muktuk must reach Luke in time or risk losing him to the Arctic elements. “The Journey Home” is delightful and engaging and a film the whole family will enjoy. It teaches the importance of believing in oneself and the significance in accomplishing a task once it has been initiated. The bear cub is beyond adorable and will have the kiddies smiling from ear to ear.